Few cities embrace their sports heroes like Philadelphia does. Therefore, those who witnessed the game at the Spectrum on April 17th, 1987 will surely never forget it. They witnessed not only the honoring of a legend, but also saw another chapter added to the legacy. In his last regular season home game, an entire city gave him a first-class farewell. In turn, Julius Erving's giving nature showed through again. By attaining the 30,000-point plateau with a remarkable 38-point performance, Erving gave Sixers fans one more sensational thrill to remember him by. The man they called "The Doctor" went out and performed one more miraculous operation. For one night, he turned back the clock seemingly by a decade with moves that were thought to have long since been relegated to highlight reels and locked away forever. The crowd acted as if it was 1977, too, voicing its excitement every time Erving touched the ball, shaking the Spectrum rafters when he scored a basket. Erving's record didn't seem reachable, since he was averaging only 16.3 points a game and had not scored over 30 points in any game that season. But as the game unfolded it became clear that Dr. J had his mind set on getting the 30,000-point milestone and he was going to get it with the flair and showmanship of a legend. In hindsight, the 76ers brass could have done away with the glitzy pre-game tribute and career retrospective. As it turned out, the best tribute of all came during the game itself. 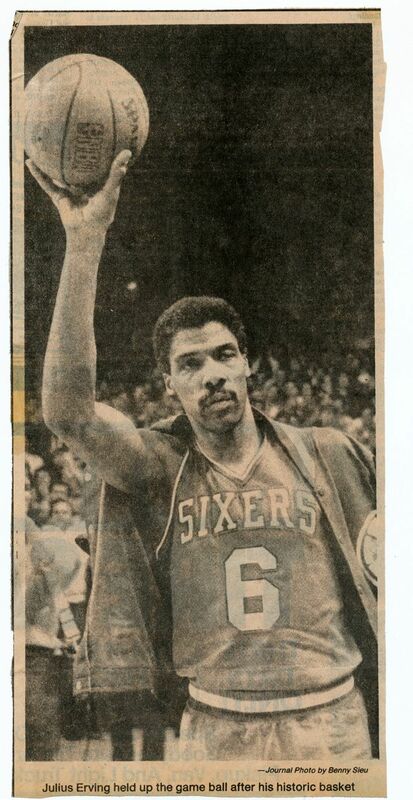 Nothing could better demonstrate the kind of athlete and person Dr. was and is - or what he has meant to the game - than did the riveting performance Julius Erving gave on the basketball court during his last game in Philly. 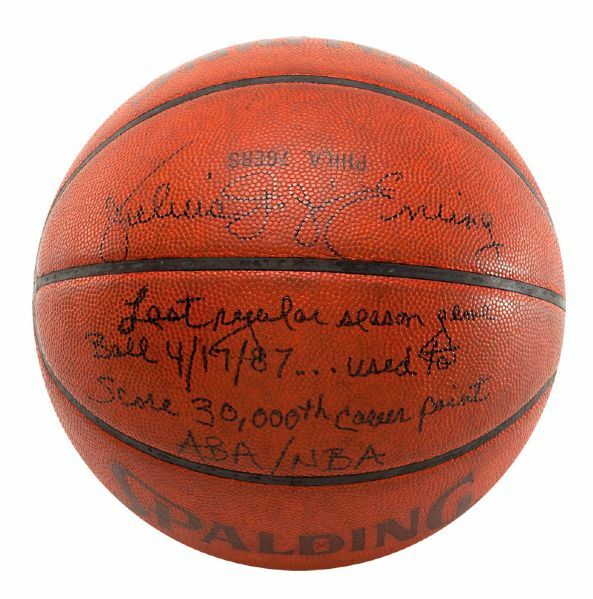 Presented here is the ball used in Dr. J’s final Sixers home game, the same ball he used to surpass the 30,000 career point milestone, a plateau reached by only three other players in history (Wilt Chamberlain, Kareem Abdul-Jabbar and Karl Malone). The official NBA game ball, bearing the “PHILA. 76ERS” team stamp shows proper game use. 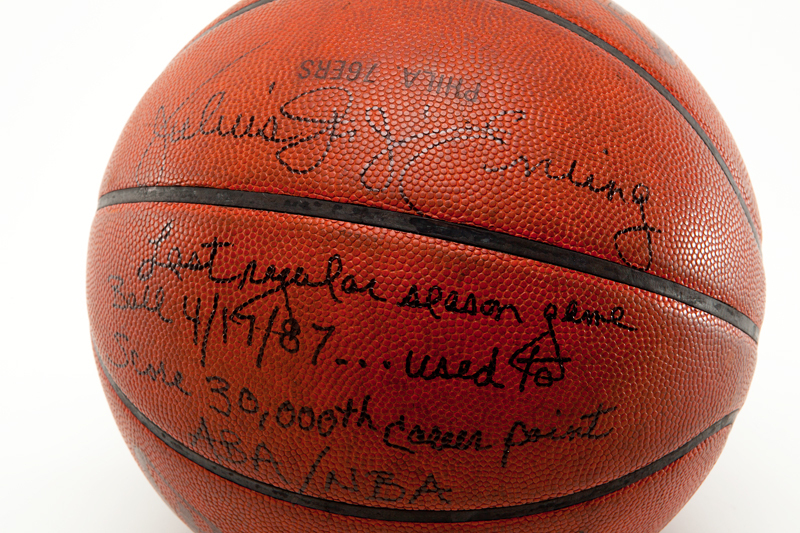 Erving has signed the ball and inscribed it, “Last Regular Season Game Ball 4/17/87…Used to Score 30,000th Career Point ABA/NBA.” This remarkable memento commemorates one of the greatest nights in “The Doctor’s” storied career.